There has been much talk by our purloined and pampered politicians, pundits, preachers and their backs on Wall Street about the need for all of us to sacrifice. They seem to pushing harder and harder for the men and women that have served in thankless wars for the last 10 years and our families to again take a bullet for the country as they and their supporters refuse to sacrifice anything for the country. You see the volunteers that have sacrificed to serve in time of war and on deployment after deployment have answered the call are expendable when push comes to shove. We’re entitled you see, and our benefits much too generous. They must be cut because no one else wants to sacrifice and they are so few that their votes really don’t matter. Back inBritain’s colonial days the Soldiers, Sailors and Marines of the Royal Army, Royal Navy and Royal Marine Corps, and later the Royal Air Force served around the world but went without thanks at home. The American “Doughboys” took to the streets ofWashingtonDCin the midst of the depression seeking their bonus from the war because of they had lost their jobs in the Great Depression. They were driven from the streets and brutalized by troops under the command of General Douglas Macarthur who had commanded many of them in the Great War. 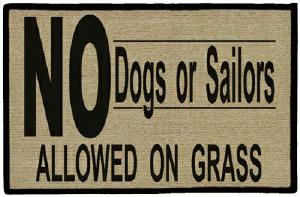 In many towns near bases in our fair land once stood signs in lawns that said “Dogs and Soldiers (or Sailors) keep off the grass.” My late father told me of seeing these signs in Jacksonville Florida in the 1959s. 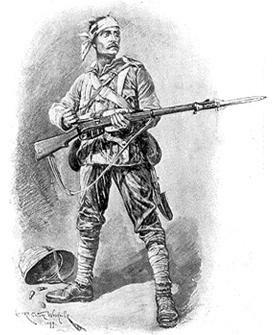 The great poet Rudyard Kipling wrote the Poem “Tommy Atkins” which was dedicated to the soldiers that at the beginning of war were cheered and in peace jeered. 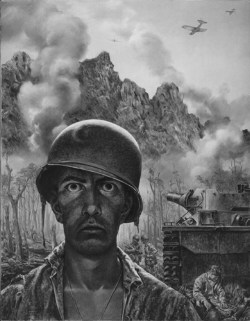 A. Lawrence “Larry” Vaincourt penned “Just a Common Soldier” in 1987. Both speak volumes to the situation that exists in theUnited States as well as our alliesBritain,Australia, France andGermany as each government and their financial backers cast their veterans aside. They say it better than I so I leave you tonight with these two great poems. Something to think about the next time some Senator, Congressman, pundit, other political hack or Wall Street corporate raider says that veterans have it too good. He was getting old and paunchy and his hair was falling fast, and he sat around the Legion, telling stories of the past. Of a war that he had fought in, and the deeds that he had done, in his exploits with his mates; they were heroes, every one. And tho’ sometimes, to his neighbours, his tales became a joke, all his Legion buddies listened, for they knew whereof he spoke. But we’ll hear his tales no longer for old Bill has passed away, and the world’s a little poorer, for a soldier died today. He will not be mourned by many, just his children and his wife, for he lived an ordinary and quite uneventful life. Held a job and raised a family, quietly going his own way, and the world won’t note his passing, though a soldier died today. When politicians leave this earth, their bodies lie in state, while thousands note their passing and proclaim that they were great. Papers tell their whole life stories, from the time that they were young, but the passing of a soldier goes unnoticed and unsung. Is the greatest contribution to the welfare of our land a man who breaks his promises and cons his fellow man? Or the ordinary fellow who, in times of war and strife, go`s off to serve his Country and offers up his life? A politician’s stipend and the style in which he lives are sometimes disproportionate to the service that he gives. While the ordinary soldier, who offered up his all, is paid off with a medal and perhaps, a pension small. It’s so easy to forget them for it was so long ago, that the old Bills of our Country went to battle, but we know it was not the politicians, with their compromise and ploys, Who won for us the freedom that our Country now enjoys. Should you find yourself in danger, with your enemies at hand, would you want a politician with his ever-shifting stand? Or would you prefer a soldier, who has sworn to defend his home, his kin and Country and would fight until the end? He was just a common soldier and his ranks are growing thin, but his presence should remind us we may need his like again. For when countries are in conflict, then we find the soldier’s part is to clean up all the troubles that the politicians start. If we cannot do him honour while he’s here to hear the praise, then at least let’s give him homage at the ending of his days. Perhaps just a simple headline in a paper that would say, Our Country is in mourning, for a soldier died today. I have always carried one line from “Tommy Atkins” close to my heart, and have used it on many occasions when I hear pinheads claiming the military road is an easy one. It’s the last stanza: “It’s Tommy this, and Tommy that, and chuck him out, the brute/ But it’s Savior Of His Country when the guns begin to shoot.” That got a LOT of use during my days in downtown Chicago in the late 80s, as co-workers and I would pass ex-soldiers begging, before the public’s image got a much-needed realignment following Desert Storm. It’s a heinous crime that the public should NEED that kind of realignment, EVER. George Santayana wrote, “Those who can not remember the past are forced to repeat it.” This is why our respective histories must NEVER, ever be forgotten.